Disclaimer: I received a complimentary copy of this book from Charlesbridge via Netgalley in exchange for an honest review. 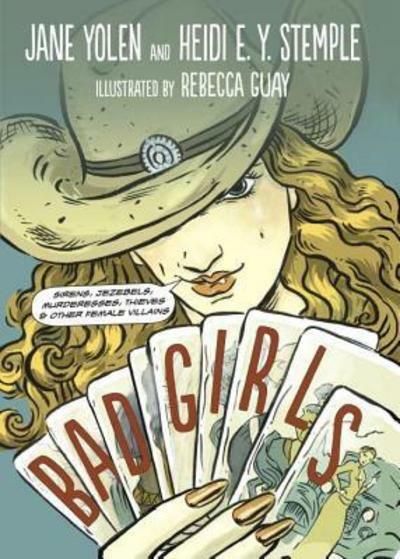 Written by the mother and daughter team of Jane Yolen and Heidi E. Y. Stemple, this book takes a look at some famous “bad girls” of history. Some are indisputably immoral, such as the Countess Elizabeth Bathory who murdered hundreds of young women out of boredom and vanity, while others like Typhoid Mary didn't mean to cause any harm (though that doesn't make her victims any less dead). Some used their charms to get what they wanted, like Salome, Mata Hari and professional gangster's moll Virginia Hill. Others like the pirates Anne Bonney and Mary Read and the “black dog” Moll Cutpurse preferred swords and pistols. What all these women have in common is that their place in history is secured by their bad reputations. Each chapter gives a brief biography of each woman and details her “crimes”, then there is comic drawn by Rebecca Guay in which the two authors debate each woman's guilt or innocence and discuss any mitigating factors. For example, Cleopatra being raised to behave as a goddess among mortals might explain if not excuse her testing out different poisons on her slaves, and the fact that Bonnie Parker was only nineteen when she met and fell for Clyde Barrow, who was already a wanted man. They talk about the way many of the women's actions might be viewed differently today, and how the same woman could be a villainess to the people on one side of a conflict and a hero to the other. For example, Delilah's betrayal of Sampson made her a hero to the Philistines and a traitor to the Israelites. They also take note of how the information we have about these women is often incomplete or biased. My one criticism of the book is that the line between reliable historical data and hearsay or legend is not always clear with Bible stories being presented as historical fact. Bad Girls would be good for helping to get reluctant children and teens interested in history, and makes a good jumping off point for further research. It would also be good for starting discussion about the way public morals change over time, and the fact that the same actions can be viewed very differently by different groups of people. Yolen and Stemple offer no definitive answers, only an interesting discussion of some of the most fascinating women who have ever lived. Are you ever embarrassed to be a romance reader?